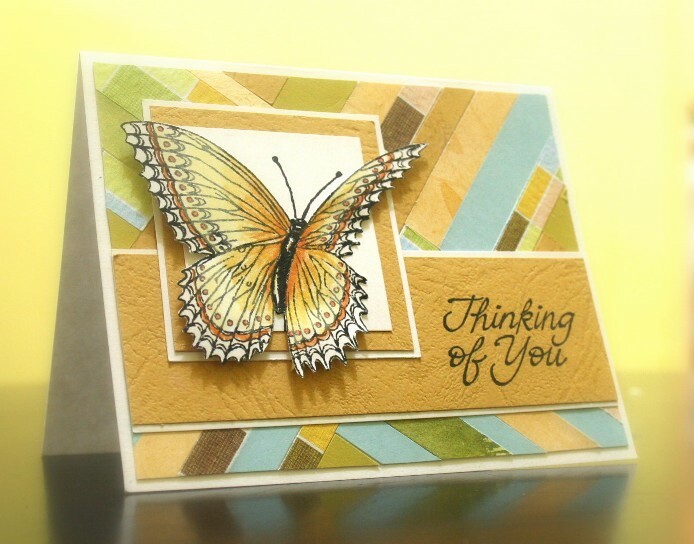 Thought I'd share a little tutorial on making the scrap strip background, shown in this card here. :) I have the hardest time throwing scraps of paper away, and I always end up with long strips. This is an easy way to use them up. Start with enough coordinating scraps to fill a card front. Lay a long strip down at a diagonal. Make sure it's long enough to hang off both sides of the card. Once the first strip is in place, begin laying down additional strips perpendicular to it. Trim them at the edges of the card as you go, so you have more matching pieces to work with. Work out to the edges from the center, so you don't end up boxing in a weird space. Alternate perpendicular and parallel pieces. Keep going till your space is filled! Almost forgot stamp credits for the card above - the butterfly is from www.jimstephan.net - he has some wonderful stamps, and I have a full sheet of butterflies from him (this one didn't come on it so I had to buy it separately). Thinking of You saying is from Art Impressions. Also, the square background paper is a free download from www.oscraps.com. 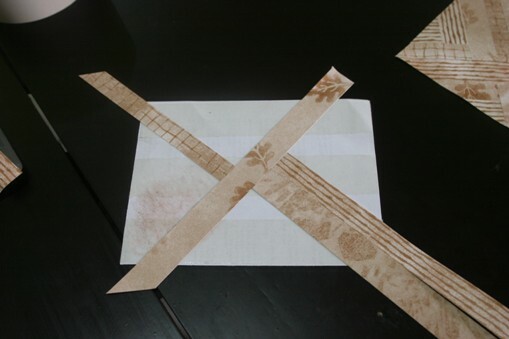 What a great idea for using up all those long, narrow paper scraps. 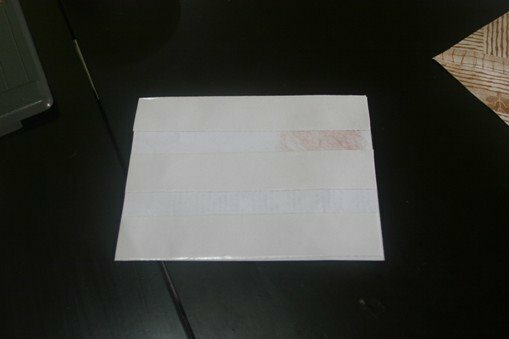 Thanks for the tutorial -- your sample card is lovely! Clever and practical but even more: great inx. and visuals for those of us who don't always understand written explanations! Thanks. What a super idea! 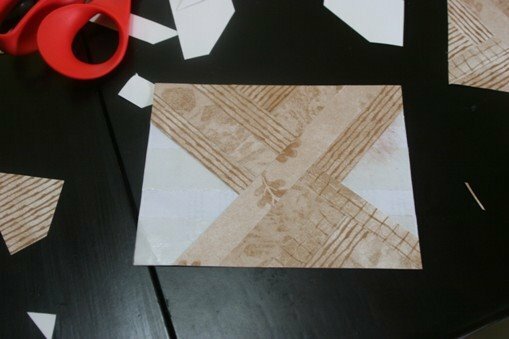 I have been trying to decide what to do with all my scraps, and this will be a fun thing to try. Thanks! Really great looking card! I love how you colored the butterfly, too. Thanks for the tutorial - I think I'm going to try it soon, as my scraps are reallly mounting, lol. Love this and I am so going to use it. I have a life time of scaps and what a 'green' technique!!! These are fabulous! Love the beautiful backgrounds! Thanks for sharing your talent!